The stark reality of recent years is that The American Dream – a perfect, safe and utterly protected life in suburbia – has been revealed to be a fantasy for most. That citizens no longer trust their police forces is a contributing factor. 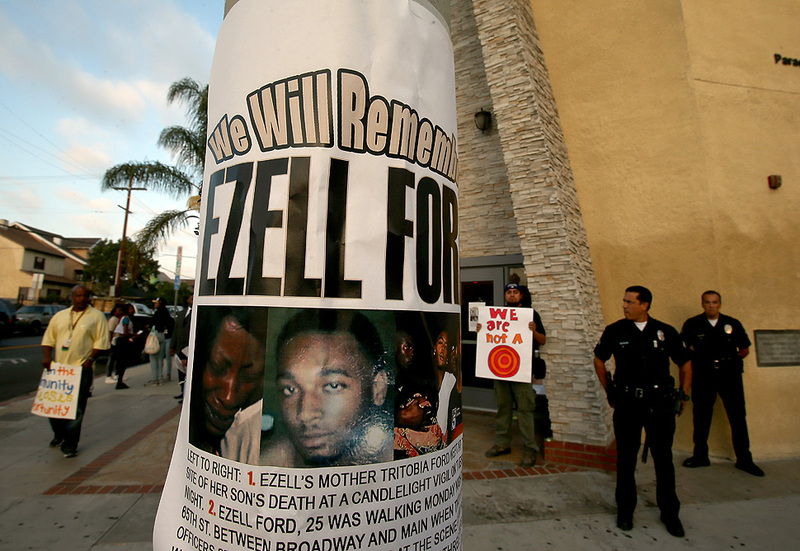 Just two days after the shooting of Mike Brown in Ferguson Missouri sparked outrage nationwide, law enforcement officers in Los Angeles killed an unarmed black man named Ezell Ford. But unlike police in Ferguson, the LAPD must contend with the additional element of mental illness. The area where the incident took place is gang territory, and the officers who stopped Ford were veterans on the gang task-force. Ford had previous encounters with police, and his family alleges that his mental condition – Ford suffered from schizophrenia and bipolar disorder – was well known to the local police community. In a parallel to Mike Brown’s shooting, the account of the situation from official police channels and community eyewitnesses are vastly different. The LAPD statement accuses Ford of behaving aggressively towards officers and making suspicious movements, and eventually a struggle ensued between the officers and Ford. Ford’s family and witnesses claim that the man was complying with the officer’s orders, and was shot while lying on the ground. The officers involved have not been identified. The details surrounding his death are in dispute, but what is not disputed is that Ford lost his life before being given the opportunity to speak with a lawyer or have a trial before a jury. It is another case of someone being brought to “justice”, before guilt was proven. His death is another piece of the bigger puzzle surrounding excessive policing all over the nation. Yet, the mental illness component of the Ford incident brings to light another fact about incarceration in the United States. It is well known that there are tremendous racial disparities in incarceration, and according to the NAACP African Americans constitute nearly 1 million of the total 2.3 million incarcerated population. However, it is less known that a Justice Department study found that over half of all inmates in US prisons suffer from mental illness. The number of people without previous mental history before their time in prison who are then are diagnosed alludes to the fact the mentally ill are more likely to attract the attention of law enforcement. The question should be how to stop people suffering from mental illness from getting into state and federal prisons in the first place. According studies done in San Diego and Albuquerque, police are coming into contact with the mentally ill on an increasing basis. They are taught special techniques on how to handle the situation, including telling officers to “move slowly, being careful not to excite the subject” and to “provide reassurance that the police are there to help.” According to witness in the Ford case, these techniques were not put into place. The LAPD has a Mental Health Evaluation Team, but without these specialized members present police officers are left to evaluate situations and use normal crisis intervention techniques. This leaves increasing room for error with mentally ill suspects, who are most often brought in for drug or property related offenses. In the Ford case, much is left to question. Was he reaching for a gun, threatening the lives of the officers, or simply profiled on the streets by the LAPD? Just like the many unsolved cases of excessive police force before his, we may never truly know. Very good piece of reporting.